On the 20th (Thu), take in the pleasant sights at Baisaran. Get ready for a full day of sightseeing on the 21st (Fri): don't miss a visit to Chandanwari, admire the verdant scenery at Aru Valley, and then tee off at Pahalgam Golf Course. For maps, where to stay, traveler tips, and more tourist information, refer to the Pahalgam trip maker . Lucknow to Pahalgam is an approximately 6-hour combination of flight and taxi. You can also do a combination of flight and bus; or drive. Traveling from Lucknow in June, you will find days in Pahalgam are cooler (30°C), and nights are slightly colder (20°C). 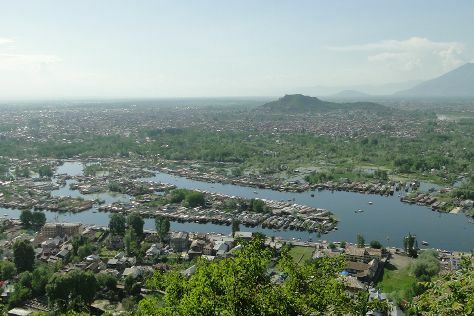 Finish up your sightseeing early on the 22nd (Sat) so you can go by car to Srinagar. Srinagar is known for nature, parks, historic sites, scenic drive, and shopping. Your plan includes some of its best attractions: make a trip to Shankaracharya Hill, admire the natural beauty at Nishat Garden, take in the dramatic natural features at Sonamarg, and contemplate the waterfront views at Nigeen Lake. For ratings, where to stay, and other tourist information, go to the Srinagar trip itinerary builder . Getting from Pahalgam to Srinagar by car takes about 1.5 hours. Other options: take a bus. In June in Srinagar, expect temperatures between 30°C during the day and 20°C at night. Wrap up your sightseeing on the 27th (Thu) to allow time to travel back home.